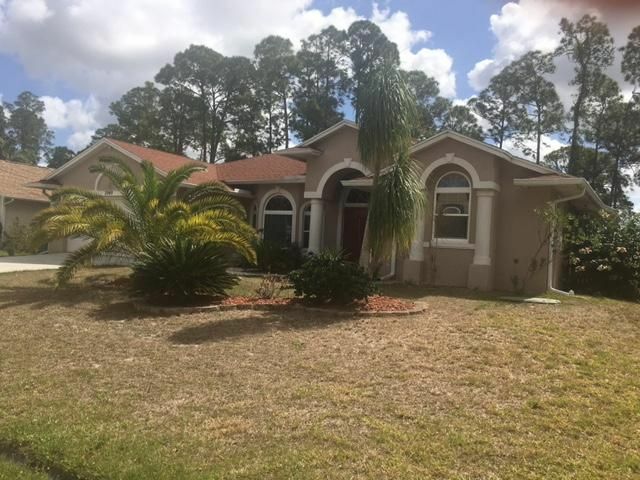 2949 SW Collings Drive is a three (3) bedroom, two (2) bathroom home located in Port St Lucie. This home is fitted with impact glass/energy efficient windows that allow plenty of light into the open floor plan of the home. The kitchen has an eat-in island and a breakfast nook with panoramic views of the backyard. His and hers closets are found in the master bedroom which has a sliding glass door to the patio. Additionally, the master bath features a cultured marble, roman tub. The fenced backyard can be accessed by screened in patio or the cabana bath. To see this property, contact a Distinct Estates agent today!